Monrovia, Liberia - President George Manneh Weah has called on the youth of Liberia to guard themselves against unhelpful influences, rise up to the reality of changing times and be patriotic in their undertakings. He cautioned Liberian youth to beware of pseudo revolutionaries, eschew actions and practices that are inimical to peaceful coexistence. He described dialogue as the only surest way to finding solutions to even the most intractable issues, urging youths to put dialogue at the front-burner in their daily interactions with people and groups. The Liberian leader made the remarks Friday, January 25, 2019 at the induction of the new leadership of the Federation of Liberian Youth (FLY) at the Monrovia City Hall. He therefore admonished the youth of Liberia not to follow failed self-proclaimed revolutionaries who have nothing to show as achievements. He described revolutionaries as true patriots who find solutions to complicated national problems and lead their followers towards the actualization of their dreams and aspirations. He warned the youth further: “Cowards do not have a sense of stability to lead. Only people with positive minds can lead. This is your time. Drive yourself through life with the inclination to promote peace. Always engage in dialogue, not violence, as a way of solving problems politically”. 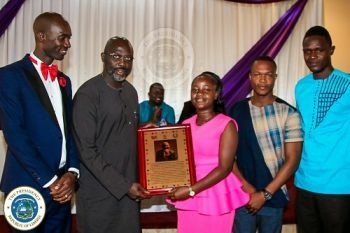 The President however told the jam-packed hall of youth at the FLY induction program not to be carried away by the actions of those who do not have the trail of success in their self-imposed revolutionary lives. President Weah urged the new leadership of FLY to think outside of the box by working with his government and partners to redirect the trajectory of advocacy. This, he said, will give the youth equal opportunities that can prepare them for vibrant future leadership and contribution to society. President Weah said education was not necessarily how much books one read or wrote but is determined by one’s innovation and accomplishments that are helpful to society and humanity. The President bemoaned FLY’s inability to own its office despite its existence spanning forty years, stressing this is not a honorable record for such an important organization. He called on the newly inducted President of FLY to strive for self-control, and learn not to imitate negative tendencies.